Verizon launching Samsung Reality SCH-U820 on April 22nd 2010. 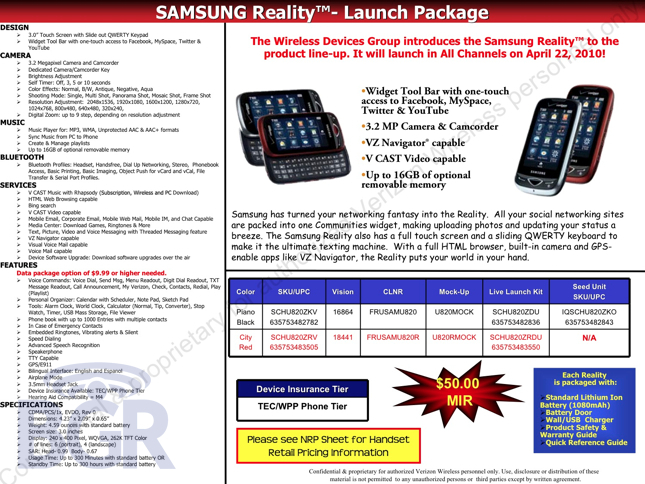 According to BGR Verizon wireless is going to launch Samsung Reality on April 22nd 2010. Samsung Reality SCH-U820 features 3-inch 240×400 WQVGA resolution screen, 3.2 mega pixel camera with LED flash and video recorder, 3.5mm headphone jack, Bluetooth with stereo audio support, one-touch access to different social networking widgets for facebook, twitter, youtube, & myspace. Verizon will offer all these featurea for you for a 2 year contract and US $9.99 per month.